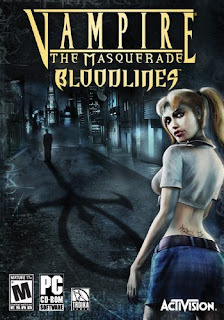 Based on Vampire: The Masquerade, the story-telling RPG designed by White Wolf, Vampire: The Masquerade Bloodlines places you in the shoes of a newly turned vampire whose sire (the vampire who turned you) is killed for breaking vampire law. You are set in the service of Prince LaCroix, the leader of the Camarilla vampires within the city, and are sent straight to Santa Monica for your first mission. The game spans across four districts of L.A., and the major goal of the game is to uncover a supernatural artifact called the Ankaran Sarcophagus for the Prince. The story goes very in-depth, and players will learn much about the different bloodlines, political sects, and hidden agendas of vampires and humans during both the main storyline and the numerous side quests available. The game starts off on a positive note with character customization. You can choose from one of seven clans as well as gender, both of which influence subsequent dialogue options. From there, players can customize their character however they so desire, making for some rather unique combinations, including a seductive computer hacker, an intimidating gunslinger, or a persuasive brawler. Stats greatly influence not only dialogue but world interactions, such as lock picking, hacking into computers, and effectively fighting in combat, so planning ahead is key. If you choose a clan that goes against what you want, such as picking a Tremere vampire who uses blood magic while wanting to be a fighter, then you’ll have great difficulty in enjoying the game. After character customization, you are shown several cinematics, in which the political background and foundation of modern vampiric society is displayed at its finest. The laws, known as the “Masquerade,” are extremely important in the game, and breaking vampiric laws results in a Masquerade violation. Invoking too many violations, such as feeding or using abilities in public, not only causes your fellow vampires to hunt you down, but also attracts the likes of witch-hunters. The gameplay is rather basic; your job is to complete as many quests as possible, obtaining as much experience as possible, in order to make the strongest vampire ever. Easy, right? While the quests are indeed rather fun, the experience points rewarded are oftentimes a bit sketchy. There are times when players will think “only one point for killing a leader of a death cult? !” This can make leveling up your character seem tedious and unbalanced, particularly at the beginning of the game. Unfortunately the game can often be weighed down by the sheer amount of loading time. Every time you enter a building or area, be it a place you never visited or a place you have visited a hundred times, the game takes some time in loading the area. Most loading screens run rather smoothly and quickly, but the massive amount of loading screens (accompanied with tips on gameplay as well as information on the World of Darkness background) can also be tiring to go through, particularly if you’re merely visiting an area to view an email or talk to someone standing next to the door on the other side. The sense of atmosphere in Bloodlines is extremely well done. Graphics are good on the whole, although cinematics (particularly when you choose a female character) could have been much improved. Timing always seems a bit off between sound and movement, and as a female character, you will take note that your chest is sunken in and your stature seems to have been designed to mimic a male character’s stature. Not something you want to see while listening for cues as to your next destination. The backgrounds are nicely designed, however, as the musical soundtrack adds a level of dimension that is quite impressive. The music is just right for the area: haunting themes in haunted mansions, pulse-pounding background to combat areas, and a nice mixture of techno and Gothic music for the number of clubs you visit during your travels. The dark, gritty feeling of L.A. is captured nicely, and proper attention has been given to buildings and scenery. There are two major flaws in Bloodlines, however. The first is the combat system; it relies on your stats in combat (naturally), but it seems more like a “mashing of the buttons and praying you hit your target” system. Guns are practically useless, as they do little damage to supernatural entities (the exception being a shotgun), and even with a high skill level you will find that a majority of your shots miss for no apparent reason. Melee and fighting hand-to-hand are a bit better, as these attacks typically do more damage, but there is also an obscene amount of hitting-and-missing action going on. You can see the blade hit the enemy, yet it will register as a miss. The only fun part about combat is your vampiric abilities (each clan obtains three distinct powers), and even some of those are worthless in combat. The other problem is that there are glitches everywhere. Literally everywhere. In fact, players who purchase the game must download Patch 1.2 from the official website in order to complete the game, since the game is known to crash at specific points throughout the main quest line. Once downloaded, however, there are still plenty of problems, including errors in items, dialogue options not appearing when they should, quest errors, and issues concerning character placement and camera. While all these glitches are rather minor things, they tend to add up to a frustrating overall experience. Despite these two major flaws, the game itself is a unique addition to the RPG genre. The storyline is original and dark, and the amount of customization available to players, both for their character and for the development of storyline, is quite enjoyable. 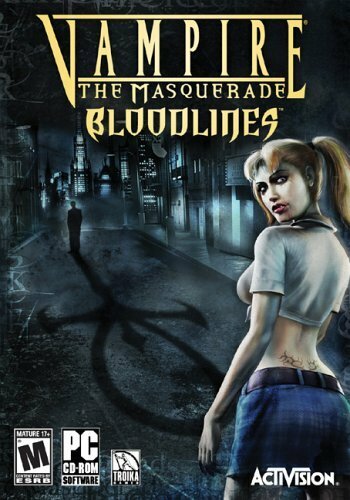 The fact that there are five available endings also makes Vampire: The Masquerade Bloodlines worthwhile to play over and over again, as players will be able to change sides each new night.